The Permian Basin, 250 miles wide and 300 miles long, remains the most economic and productive oil basin in the US, and it is world-competitive. Due to its stacked pay—from four benches to as many as twelve—producers consider “acreage” costs in terms of three-dimensional cubes rather than two-dimensional surface area. The Permian’s hydrocarbon column is three times as deep as Oklahoma’s Stack and ten times as deep as North Dakota’s Bakken. Cumulatively, the Permian Basin has produced 28.9 billion barrels of oil and 75 trillion cubic feet of gas. Remaining hydrocarbon estimates range from 43 billion barrels of oil and 18 TCF of gas to much more. The US Department of Energy’s most recent Drilling Productivity Report shows Permian Basin oil production of 2.6 million barrels per day (BPD) and gas production of 8.9 billion cubic feet per day (BCF/D). Permian’s oil production is more than twice as much as the next closest region, the Eagle Ford at 1.2 million BPD. 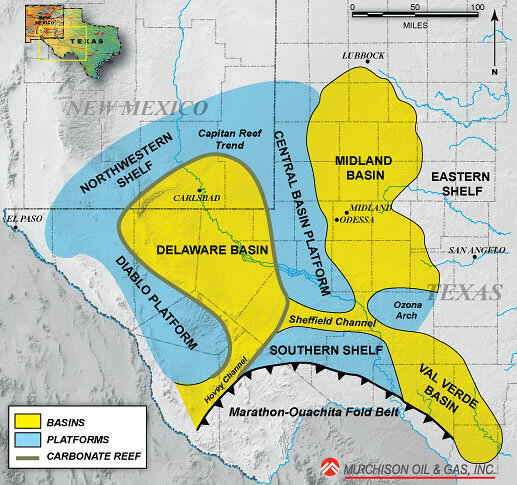 As the map above shows, the Permian has two “sides”—the traditionally-explored Midland sub-basin on the east, and the newer Delaware sub-basin to the west. In between is the Central Basin Platform, which is not prospective for hydrocarbons. The Midland sub-basin has been drilled vertically to the Spraberry target since the 1940s. Producers thus benefitted from the data of these thousands of wells as they began drilling horizontally during the last several years. In addition to the Upper and Lower Spraberry, newer horizontal targets include the Wolfcamp A and B. The subscriber section reviews public companies operating in the Midland sub-basin of the Permian Basin.